zygons | Randomwhoness: a Doctor Who blog by Johnny Spandrell. Sampling stories in random order. As series 9 loomed, this story as described by its pre-publicity, didn’t seem to be one which would offer too many shocks. After all, it’s a UNIT story, usually a signal to expect a standard aliens vs army runaround. What’s more, it’s got a return appearance from old favourites the Zygons, who may have been sinister, bloated foetuses on 70s debut Terror of the Zygons but who had become slightly comical sidebar villains in The Day of the Doctor. By rights we should know what to expect from this story, and it should be action packed, light hearted fun. But like a vicious alien monster disguised as a beautiful woman, the outward appearances hid something far more frightening. The Zygon Invasion/The Zygon Inversion takes the trappings of 70s Who by numbers and anniversary hijinks and makes them the conduits for a Doctor Who take on terrorism and its underlying causes. It’s an uncompromising face slap of a story. Right from the beginning it’s creating unusually visceral imagery, such as when we see Osgood (Ingrid Oliver) taken hostage, flanked by her captors and their monochrome flags, forced to read a propaganda ridden statement. As if it’s not shocking enough for Who to mimic terrorism onscreen, the tormentee is a scarf-wearing superfan. She’s us, kidnapped by ISIS. 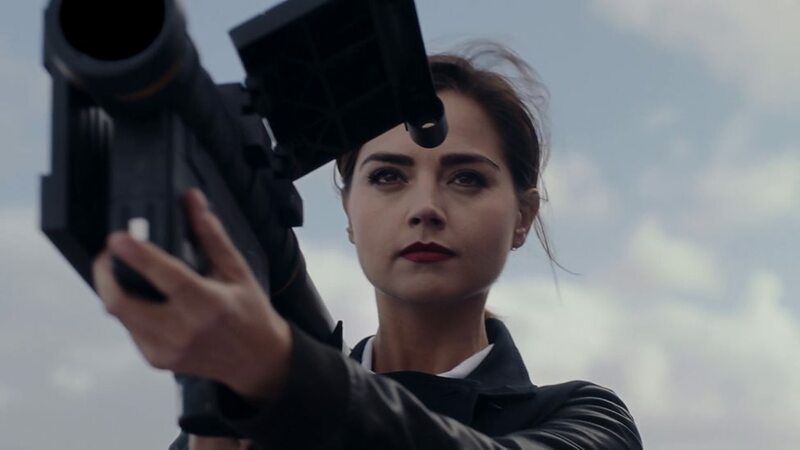 Coming a close second for disturbing imagery is Clara-impersonating Zygon Bonnie (Jenna Coleman) shooting down a plane. At time of broadcast, it was barely a year since Malaysian Airlines flight 17 was brought down over Ukraine by a surface to air missile, killing all on board. To end an episode with a similar incident feels shockingly contemporary, but it’s also very close to tastelessness. And for a third? How about the moment when Kate Stewart (Gemma Redgrave) on assignment in the New Mexican town of Truth or Consequences is shown a dumpster bin full of buzzing hairballs, the remains of humans fried by Zygon weaponry. Her revolted expression tells us the story, but then we pan over to see a line of other bins, and without seeing any violence, we get an acrid taste of the scale of the atrocities committed in this town. (And it makes us think back to when Kate rode into that town and a couple of random tumbleweeds tumbled through shot. These could so easily be mistaken for cliched indulgences from the art department, but now we wonder if they were in fact human remains). Grim stuff, but this is meant to shock. It’s meant to provoke. And it does so not just through these big moments, but through a smart script that draws its analogies sharply without them seeming crass. Think how badly talk of radicalising Zygons and splinter groups could have gone. Think of the sledgehammer political commentary of Aliens of London/World War Three, for instance. Successfully avoided by writers Peter Harness and Steven Moffat, whose treatment of the subject matter never makes us think equating Zygons with terrorists is dumb; rather that it seems an obvious match. Terror of the Zygons, indeed. In that original story, the Zygons were just generically evil baddies, blessed with some outstanding design work and some better than average direction. On that occasion, the Doctor saw no shades of grey in these orange suckers; he simply blew them up as soon as was practicable. There was no attempt to uncover a sympathetic edge to this race, as might have been sought during the Pertwee era. The Day of the Doctor added little more to them. But here, we learn more, that there are peaceful and warlike Zygons, but that most want to live out their lives safely undercover. It’s a big change and adds far more depth to this once most generically drawn of species. This makes the threat that the splinter group Zygons represent far more potent, because we can compare them to the worst of humanity. We know how appalling human terrorists are so we have a sense of how awful Zygon terrorists must be. It’s far more dramatic this way, knowing that you’re dealing with the very worst a race can drag up. And these bad guys are far scarier when they look just like us, not like calamari. The sequence of the UNIT soldier being unable to shoot a Zygon in the shape of his mother is tangibly frightening. And when Bonnie forces a Zygon to unmask in the middle of a shopping mall, she’s enacting the terrorist’s modus operandi of instilling fear of going about your daily business. As the Doctor says, panic and paranoia are their trade. These episodes give us some of the edgiest material the program has ever served up, so it’s almost a shame when the plot has to reassert itself and move us towards some sort of climax. And that climax, is effectively a repeat of the sequence in The Day of the Doctor where Kate and her Zygon counterpart were forced into negotiation. It’s a small scale end for such an action-packed story, just the two chief protagonists, fingers poised over buttons and the Doctor on hand to referee. So if you’re going to end a blockbuster with an extended monologue, best get it delivered by Peter Capaldi, who eats it alive with all the hunger of an aging anti-war activist who’s been railing at warmongering plutocrats since he played Amazing Grace on his guitar at Woodstock with Hendrix. It’s a moment which solidifies this Doctor; it’s difficult to imagine Matt Smith delivering this speech to the same effect. His appeal to the terrified aggressors, both human and Zygon, is to stop and think. That’s the conclusion this episode seems to draw is that terrorism is ultimately an act of stupidity and if its perpetrators just thought logically about their actions, they’d never follow through with them. Who knows whether this is true, but it’s a beautiful hopeful thought. And as the Doctor once said, one solid hope’s worth a cartload of certainties. In the pre-publicity for this story, co-writer Peter Harness talked about the influence of 50s sci-fi classic Invasion of the Bodysnatchers on this story. And true enough, in the eery “can’t tell who’s who” scenes there is a passing resemblance. But actually, The Zygon Invasion/The Zygon Inversion is cleverer than that film, a one-note screed against communism. This is a nuanced commentary on current affairs and a taut thriller into the bargain. What really makes it exhilarating though, is the realisation that every now and then Doctor Who, that venerable old show, still has the power to shake itself and its viewers out of the comfort zone. LINK TO: The Chase. Duplicates. But more convincing. NEXT TIME… It’s a game, within a game. 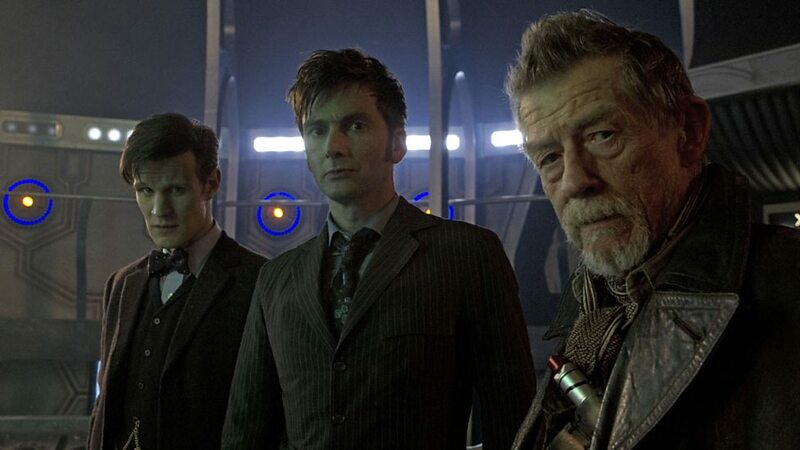 A chance to remeet old friends and The Five Doctors.